This protocol describes a robust, reproducible and simple method of isolation and culture of myoblast progenitor cells from the skeletal muscle of adult and aged people. The muscles used here include foot and leg muscles. This approach enables the isolation of an enriched population of primary myoblasts for functional studies. 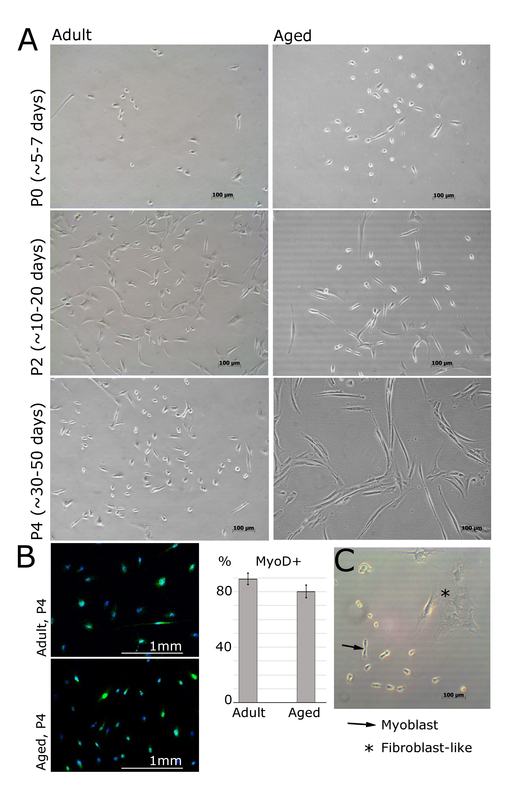 Soriano-Arroquia, A., Clegg, P. D., Molloy, A. P., Goljanek-Whysall, K. Preparation and Culture of Myogenic Precursor Cells/Primary Myoblasts from Skeletal Muscle of Adult and Aged Humans. J. Vis. Exp. (120), e55047, doi:10.3791/55047 (2017). Skeletal muscle homeostasis depends on muscle growth (hypertrophy), atrophy and regeneration. During ageing and in several diseases, muscle wasting occurs. Loss of muscle mass and function is associated with muscle fiber type atrophy, fiber type switching, defective muscle regeneration associated with dysfunction of satellite cells, muscle stem cells, and other pathophysiological processes. These changes are associated with changes in intracellular as well as local and systemic niches. In addition to most commonly used rodent models of muscle ageing, there is a need to study muscle homeostasis and wasting using human models, which due to ethical implications, consist predominantly of in vitro cultures. Despite the wide use of human Myogenic Progenitor Cells (MPCs) and primary myoblasts in myogenesis, there is limited data on using human primary myoblast and myotube cultures to study molecular mechanisms regulating different aspects of age-associated muscle wasting, aiding in the validation of mechanisms of ageing proposed in rodent muscle. The use of human MPCs, primary myoblasts and myotubes isolated from adult and aged people, provides a physiologically relevant model of molecular mechanisms of processes associated with muscle growth, atrophy and regeneration. 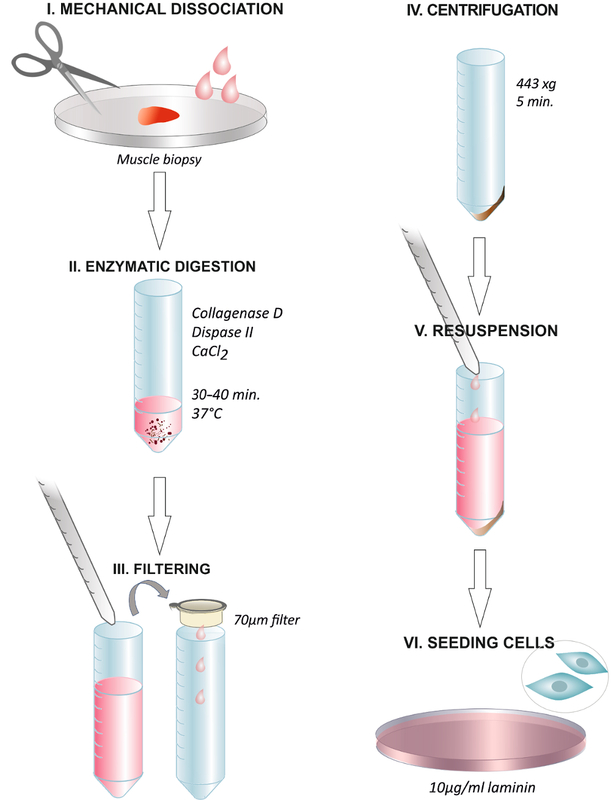 Here we describe in detail a robust, inexpensive, reproducible and efficient protocol for the isolation and maintenance of human MPCs and their progeny — myoblasts and myotubes from human muscle samples using enzymatic digestion. Furthermore, we have determined the passage number at which primary myoblasts from adult and aged people undergo senescence in an in vitro culture. Finally, we show the ability to transfect these myoblasts and the ability to characterize their proliferative and differentiation capacity and propose their suitability for performing functional studies of molecular mechanisms of myogenesis and muscle wasting in vitro. Disease- and age-related progressive loss of skeletal muscle mass and function results in frailty, decline in strength and decrease in quality of life of aged people. Skeletal muscle accounts for approximately 40% body mass1. During ageing and disease, progressive atrophy of individual myofibers and reduction of muscle quality due to the infiltration of fat and fibrosis occurs1,2,3,4,5,6. Recently, it has been proposed that species-specific differences in ageing of skeletal muscle occur, specifically that muscle fiber loss occurring in rodents, may not occur in humans7. Nevertheless, the remaining muscle fibers of aged mammals are characterized by increased susceptibility to damage and impaired regeneration8. Adult muscle repair and maintenance is mediated by satellite cells9,10. Upon muscle injury and other relevant cues, satellite cells become activated and proliferate. A subset of the cells returns to the quiescent state and the remainder progresses into myoblasts (Myogenic Progenitor Cells - MPCs). These contribute to repair of the existing myofiber11. The functionality of satellite cells determines the success of muscle regeneration and the changes in satellite cell availability with ageing have been demonstrated12,13,14,15. Moreover, satellite cells from the muscle of old humans and rodents show a transcriptional profile switch and reduced regenerative potential16,17,18,19. Satellite cells of muscle from old mice and humans have also been shown to undergo senescence resulting in their reduced functionality20. The most established cell line enabling the study of muscle homeostasis is murine C2C12 cell line21. A significant amount of studies have also used murine primary myoblasts22. These cultures have led to a significant understanding of murine and vertebrate myogenesis as well as muscle regeneration, myotube/myofiber atrophy, and hypertrophy processes occurring during muscle disease and ageing23,24,25,26. More recently, several groups have described using human primary myoblasts to study myogenesis and muscle ageing. However, there is lack of consensus with regards to differences between primary myoblasts isolated from the muscle of adult and aged humans27,28,29,30,31. Despite differences characterized in the systemic and local environment occurring during development, ageing and disease 6,32,33,34, in vitro myoblast and myotube cultures remain the most accessible tools for studying molecular mechanisms associated with muscle development, growth and atrophy. Additionally, these studies provide not only a robust, but also a relatively quick, inexpensive and high-throughput in vitro tool. Moreover, ethical implications associated with studies of human muscles mean that for functional experiments involving manipulations of gene expression, in vitro human myoblast and myotube cultures remain the only alternative available to vertebrate model organisms. Here, we show a simple experimental protocol for robust, inexpensive, and reproducible isolation of primary myoblasts, or MPCs, from the muscle of adult and aged people and describe standardized conditions of in vitro culture (Figure 1). As primary cultures from muscle usually contain fibroblasts in addition to myoblasts, we recommend a preplating step aiming at improved purity and quality of primary myoblasts. To summarize, we have established a protocol allowing for efficient and reproducible isolation, culture and functional studies of enriched and functional MPCs/primary myoblasts from skeletal muscle of adult and aged people. All experimentation involving human tissue described herein was approved in advance by University of Liverpool, University Hospital Aintree Hospital and South West Wales Research Ethics Committee (Approval No: 13/WA/0374) and experiments were performed according to good practice guidance. The University of Liverpool acted as the ethics sponsor for this study. All the donors have given informed consent for the enrolment of this study. The muscles were isolated from people (BMI <25): adult: 30 ±2.8 years old and aged: 69 ±5 years old. Prepare a working solution of 10 µg/mL of laminin in 1x DPBS (Dulbecco's Phosphate Buffered Saline). Pipette a minimum amount of laminin solution to completely cover the surface onto which cells are going to be plated (Table 1). Incubate the culture dish at least 30 min in a humidified 37 °C, 5% CO2 incubator before plating the cells. Handle laminin carefully, avoiding the use of vortex. The working solution of 10 µg/mL laminin diluted in DPBS can be stored at 4 °C and re-used several times. Use a 60 mm (20 cm2) Petri dish or 2 wells in a 6-well plate (2 x 10 cm2) per ~18 - 19 mg of skeletal muscle to plate the cells (5.50 x 104 cells in total). Perform cell counting at all times when plating cells for functional studies. NOTE: Samples were originally obtained from foot surgeries (extensor digitorum brevis, tibialis anterior or abductor halluces muscles) of female patients (adult: 30 ±2.8 years old, aged: 69 ±5 years old, BMI <25). Prepare 250 mM CaCl2 working solution: 277 mg of stock CaCl2 in 10 mL 1x DPBS. Filter the solution with a 0.2 µm filter membrane and store at 4 °C. Prepare a working solution of 1.5 U/mL of collagenase D, 2.4 U/mL of Dispase II and 2.5 mM CaCl2 in serum-free DMEM (Dulbecco's Modified Eagle's Medium) (Table 2). Mix well and filter the enzymatic solution through a 0.2 µm filter membrane for sterilization. Prepare the enzymatic solution in advance and freeze down (-20 °C) in aliquots for future use. Following sample collection, keep muscle at 4 °C in DPBS until digestion. Prepare a minimum volume of 2 mL of collagenase-dispase-CaCl2 solution per 18 - 19 mg of muscle tissue and warm it to 37 °C before tissue dissociation. Immerse the muscle biopsy briefly in 70% ethanol, wash with fresh DPBS and place the tissue on a new Petri dish with 1 mL of enzymatic solution. Discard as much fibrotic and fat tissue as possible and tear the muscle quickly but gently into small but distinguishable pieces (approximately >0.5 mm2) with sterile scissors or a surgical scalpel (blade No. 10). Transfer the sample into a 50 mL tube with the remaining 1 mL of the collagenase-dispase-CaCl2. Incubate the tissue at 37 °C up to 30 - 40 min. Move the muscle tissue by gently agitating the tube every 5 - 10 min. Coat the pipettes with media to avoid the adhesion of the released cells to the plastic walls of the pipettes. Add 2 volumes of sterile Growth Medium, e.g., 4 mL of DMEM 20% FBS (Fetal Bovine Serum), 1% L-glutamine and 1% P/S (Penicillin-Streptomycin), to stop the digestion. Pipet up and down several times with a 5 mL pipette to help the release of the cells from the muscle fibers. NOTE: The sample is usually completely dissociated due to its small size. However, if fragments of muscle still remain, use a second incubation with the remaining pieces of muscle and with fresh enzymatic solution. Filter the muscle solution through a 70 µm cell strainer over a 50 mL conical tube. Wash the remaining cells with more media and filter through the strainer. Centrifuge at 443 x g for 5 min at RT to pellet the cells. Discard supernatant carefully. Dissolve the pellet into F-12 media (Ham's F-12 Nutrient Mix), 20% FBS, 10% HS (Horse Serum), 1% P/S, 1% α-glutamine and 2.5 ng/mL of FGF-b (Recombinant human basic Fibroblast Growth Factor). Here, use 4 mL of media per 60 mm Petri dish. Collect the culture vessel previously coated with 10 µg/mL laminin from the incubator (section 1.1). Carefully remove the excess of laminin from the culture dish, and avoid touching the surface (or it will disturb the protein structure). Wash the culture dish with DPBS (optional). Plate the cells directly on the laminin coated vessel and incubate for 24 h in a humidified 37 °C, 5% CO2 incubator. Visualize the cells under the bright-field microscope (100X total magnification) the following day. Round small cells attached to the surface and the remaining debris can be seen in the culture media. Change the media to fresh F-12 media complemented with 20% FBS, 10% HS, 1% P/S, 1% α-glutamine and 2.5 ng/mL of FGF-b. Change the media every 2 - 3 d and split the cells as soon as groups of cells are visible under the microscope (100X total magnification, example in Figure 2, cells from aged people, passage 0, after 7 d) in order to avoid spontaneous differentiation. At the first passage (P1), change the media to high-glucose DMEM complemented with 20% FBS, 10% HS, 1% P/S, 1% α-glutamine. Avoid using FGF-b from this point, as FGF is a potent mitogen and important factor at the beginning of the culture, but it can promote fibroblast overgrowth if used longer in culture. Remove the media and wash the cells twice with DPBS. Add a minimum volume of 0.25% EDTA-trypsin to cover the surface of the cells. Rock gently to ensure all the cells are covered by the detachment solution, incubate for 10 seconds at room temperature, and remove it. Incubate the cells in a humidified 37 °C, 5% CO2 incubator for 3 - 5 min. Tap gently and check under the bright light microscope (100X total magnification) that the cells are rounded but not completely detached from the surface. If no change is observed in the cells, incubate for 5 more min. Add 5 mL of Growth Medium (high-glucose DMEM complemented with 20% FBS, 10% HS, 1% P/S, 1% α-glutamine) to collect the cells, mix well and transfer the cells with the new media into a T75 flask. Wash the remaining cells repeating this step with another 5 mL of Growth Medium (10 mL in total for one T75 flask). To preplate (preferable at the first passage), incubate the cells in a humidified 37 °C, 5% CO2 incubator for 40 min. Collect the supernatant with the cells that did not attach and incubate them in a new T75 flask. This should enrich the culture in myoblasts, as most of the fibroblasts should have attached in the first flask. Change the media every 2 - 3 d and split the cells 1 to 4 as soon as they reach 70% confluency for a maximum yield. For differentiation, once the cells reached 70 - 80% confluency, change the culture medium to Differentiation Medium (DM): high-glucose DMEM complemented with 2% HS, 1% P/S, 1% α-glutamine. The cells should be differentiated within 5 - 7 d depending on the quality and purity of the myoblast culture. Seed 50,000 cells/well in a 12-well plate for MF 20, senescence and viability assays. Culture cells on cover slips or in a dish coated with laminin. For Ki67 staining, seed 25,000 cells/well in a 12-well plate. For transfections, follow the manufacturer's procedure using 5 µL of transfection reagent, 100 nM of control microRNA mimic or inhibitor, 100 nM of microRNA mimic or 100 nM of microRNA inhibitor per well, with a total volume of 1 mL. Change to Differentiation Medium 6 h after transfection (high-glucose DMEM complemented with 2% HS, 1% P/S, 1% α-glutamine). For proliferation experiments, stain the cells 2 d after transfection; for senescence, 7 d after transfection; and for MF20 staining, seven days after transfection. Prepare block 1 (10% HS and 0.1% Triton-X in PBS) and block 2 (10% HS and 0.05% Triton-X in PBS) solutions. Use 500 µL of reagent per well for a 12-well plate. NOTE: Perform the following steps using a shaker for the incubation steps. Remove the media from the cells. Rinse the cells with PBS. Fix the cells with cold methanol for 10 min on a rocker. Remove the methanol from the cells and rinse 3x with PBS for 5 min each time. Add block 1 solution and incubate the cells on a rocker at RT for 1 h.
Add primary antibody solution: for Ki67 staining, use Rabbit mAb to Ki67 (1:1,000 dilution in block 2); for MyoD, use MyoD1 (D8G3) XP Rabbit mAb (1:100 dilution in block 2); for MF 20 staining, use MYH1E (MF 20) primary antibody (DSHB, 1:1,000 dilution in block 2). Incubate the cells with the primary antibody for 1 h (RT) to O/N (4 °C) on a rocker. Collect the primary AB (it can be re-used several times if stored at 4 °C). Rinse the cells 3x with PBS, 5 min each time. Add the appropriate secondary antibody: for Ki67 or MyoD staining, goat anti-rabbit IgG (H+L) secondary antibody, Alexa Fluor 488 conjugate (1:1,000 dilution in PBS); for MF 20 staining, goat anti-mouse IgG (H+L) secondary antibody, Alexa Fluor 488 conjugate (1:1,000 dilution in PBS). Wrap the plate containing the cells and incubate secondary antibody for 2 h in the dark on a rocker at RT. Rinse the cells 3x with PBS for 5 min each time. Add DAPI solution (1:1,000 dilution in PBS) onto the cells and incubate on the rocker at RT for 5 - 10 min. Add 1 mL of fresh PBS. Mount the cells on the cover slips in mounting solution or seal the plate containing the cells in PBS with Parafilm to avoid evaporation. Visualize the cells with the fluorescence microscope as soon as possible (no later than 2 weeks). Rinse the cells in PBS. Add 1:1,000 ethidium bromide and 1:1,000 acridine orange diluted in PBS. Caution: Take care and work within health and safety regulations — ethidium bromide is a carcinogen. Wrap the plate containing the cells in staining solution and incubate at RT on the rocker for 5 min. Take images of the cells with the fluorescence microscope: green channel for acridine orange; red channel for ethidium bromide. MPCs/primary myoblasts should be visible 24 h post seeding onto the laminin-coated surface (Figure 2). The cells should adopt a spindle-like shape and should express MyoD still in passage 4 (Figure 1A, B). Fibroblasts can be distinguished by their star-like morphology and lack of expression of MyoD (Figure 1B, C). Once the cells are attached on the following day, media should be replaced with fresh bFGF media. The culture media should be replaced every 48 h.
The representative results shown here and published data from our laboratory22 aim to support our isolation and culture protocol and demonstrate the different techniques that can be used for functional studies of human primary myoblasts. 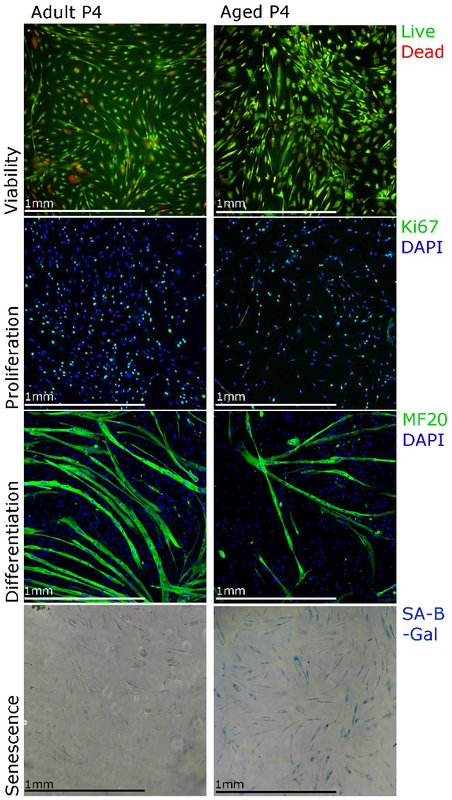 Myoblast proliferation can be studied using Ki67 immunostaining and viability using staining for cell viability assay (Figure 3). For differentiation, the culture media should be changed to differentiation media. Myotubes should form in 5 - 7 d and be myosin heavy chain positive (Figure 3). Note that the myotube formation may be less efficient when myoblasts are isolated from the muscle of aged people (Figure 3). Senescence (SA-β-galactosidase) staining can also be performed in order to establish the percentage of senescent cells in the culture (Figure 3). We observed that with longer cultures (Figure 3, passage 4), more myoblasts isolated from the muscle of aged people show senescence. For functional studies, gene and microRNA expression can be manipulated using lipophilic transfection reagents-mediated delivery of expression vectors, siRNAs, microRNA mimics and antimiRs (Figure 4). This allows for 40 - 70% transfection efficiency with gene/microRNA levels being up- or down-regulated within a physiological range (Figure 4;22). Table 1. Recommended Minimum Volumes of Laminin-DPBS Solution (10 µg/mL) for Coating Culture Surface. Table 2. Enzyme Preparation for Muscle Digestion. Figure 1. Graphical Abstract Summarizing the Steps of the Protocol. Dissociation of the human muscle biopsy with scissors or with a surgical scalpel (I). Incubation with the enzymatic solution at 37 °C for 30 - 40 min (II). End of the digestion through adding growth media and filtering the solution through a 70 µm membrane filter into a centrifuge tube (III). Centrifugation at 443 x g for 5 min (IV). Discarding the supernatant and resuspending in growth media containing 2.5 ng/mL FGF (V). Plating the cells on a dish coated with 10 µg/mL of laminin and changing the media after 24 h (VI). Please click here to view a larger version of this figure. Figure 2. Myoblasts Isolated from Muscle of Adult and Aged Humans at Different Passages. A. Images represent myoblasts isolated from extensor digitorum brevis, tibialis anterior or abductor halluces muscles of female patients (adult: 30 ± 2.8 years old, aged: 69 ± 5 years old, BMI<25). At passage 0 and after 5 days of being plated, cells are still round and small, but visible under the bright light microscope (A). Myoblasts will then adopt an elongated shape, like shown at passage 2 (A). MyoD is expressed in myoblasts but not in fibroblasts (B). Quantification of MyoD-positive cells is shown; error bars show standard deviation; n = 3 (B). Representative image demonstrating the differences between myoblast and fibroblast morphology (C). Please click here to view a larger version of this figure. Figure 3. Human Primary Myoblasts Can Be Characterized Using Different Staining Techniques. Viability of the cells can be visualized using staining for cell viability assays, proliferation can be assessed using Ki67 immunostaining, differentiation can be assessed using MF20 (myosin heavy chain) immunostaining and senescence can be visualized using senescence associated beta galactosidase (SA-β-galactosidase) staining. Please click here to view a larger version of this figure. Figure 4. Human Primary Myoblasts Can Be Used for Functional Studies of Muscle Homeostasis In Vitro. 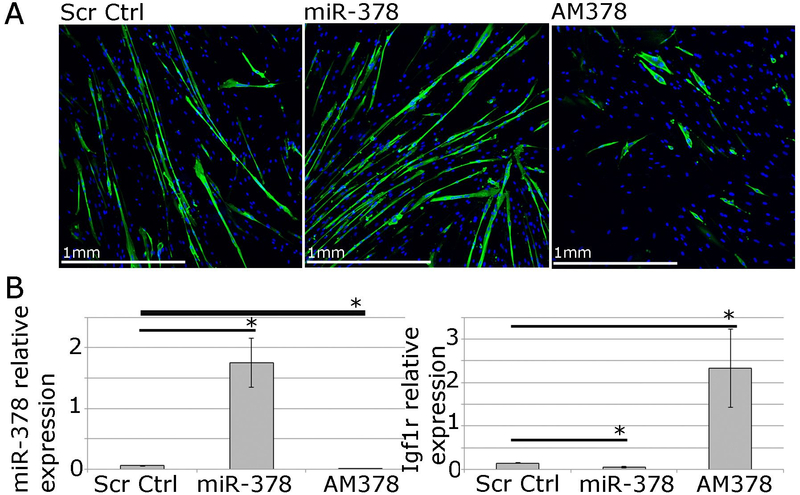 A. MF20 (myosin heavy chain) immunostaining of differentiated primary myotubes from adult humans showing the effects of overexpression or inhibition of miR-378 on myotube size and number. B. qPCR showing relative expression of miR-378 and Igf1r, validated miR-378 target gene, following miR-378 overexpression or inhibition in human primary myoblasts. Expression relative to Rnu-6 and β-2-microglobulin, respectively, is shown. Error bars show SEM; n = 3, * - p<0.05, Student T test. Please click here to view a larger version of this figure. Here, we present a simple, robust, inexpensive, reproducible and efficient method of isolating muscle progenitor cells/primary myoblasts from adult and aged humans from extensor digitorium brevis, tibialis anterior or abductor halluces muscles. This protocol aims to allow studies using human primary myoblasts from adult and aged humans, especially when more sophisticated methods, such as FACS- or MACS-sorting, are not possible or not practical. The isolation method presented in this manuscript takes approximately 2 hours. During muscle isolation, muscle was washed in 70% ethanol in order to avoid contamination. Prior to enzymatic dissociation of the muscle, it is important to cut the muscle into small but visible pieces, and avoid cell damage from too much mincing. The digestion results in the dissociation of myofibers and the release of satellite cells and myogenic precursor cells. In our case for ~20 mg of skeletal muscle, one 60 mm (20 cm2) Petri dish was the most appropriate surface area for harvesting the cells. Cells plated onto a larger surface showed reduced proliferation, whereas cells plated onto a smaller surface showed increased cell death and agglutination. Upon isolation, the cells were cultured and expanded on laminin-covered plates. The use of non-coated surfaces tended to decrease the success of the isolation. For this reason, cells can be preferably harvested on a pre-coated surface directly after isolation. Fibroblasts-enriched cultures will predominate rather than myoblasts-derived cells if the cells are harvested on a non-coated surface directly after isolation. Apart from laminin, the use of other cell attachment solutions such as Matrigel and collagen-based reagents can be used. Coating solutions may include growth factors and other compounds that will promote cell growth, but these could alter the cell behavior and therefore the experimental results. In our experience, 10 µg/mL laminin is the optimum concentration and appropriate coating reagent for satellite cells and myoblast attachment and proliferation as it lacks any growth factor or other complements. Moreover, laminin is naturally present in the basal lamina, directly linked to the sarcolemma, which plays a key function in satellite cell attachment and migration through the skeletal muscle fiber. The supplements of the culture media may also have a detrimental influence on the behavior of the primary myoblast. For example growth factor groups, such as FGFs or IGFs, have pleiotropic effects on primary myoblast cultures, with FGF-2 controlling both mitogenic and programmed cell death response31. It is therefore necessary to rigorously control the culture conditions, especially because the differences in the behavior of primary myoblasts isolated from muscle of adult and aged people are very likely to be due to the purity of the cultures and the likelihood of fibroblasts overrunning the myoblasts in culture during long-term cultures35. We have used 1-hour pre-plating of the cells during the first splitting onto a non-coated surface in order to decrease the contamination of the cultures with fibroblasts. The method we describe is appropriate for isolating myogenic progenitor cells from the muscles of both adult and aged humans. The isolated cell consists of a representative myogenic population of cells as indicated by a high percentage of myogenic cells (MyoD expression and myogenic properties visualized by MF20 immunostaining in Figures 1 and 2) and can be used as an in vitro model for functional studies of processes associated with muscle homeostasis. Previous studies have characterized the isolation and differences in properties, or the lack thereof, of human primary myoblasts from adult and aged people6,20,27,28,29,30,31,35,36,37,38. The existence of geriatric and/or non-functional human MPCs has been demonstrated6,20,22. However, no difference in the behavior of freshly isolated human MPCs has also been shown27. Our protocol allows for the isolation of primary myoblasts that at least partially retain their phenotype, such as reduced proliferative potential or senescence of primary myoblasts isolated from muscle of aged people and permits the use of these cells for functional studies of molecular mechanisms of muscle homeostasis during ageing22. The primary myoblasts isolated using the method described here can be used not only for myogenic differentiation studies but also to investigate intracellular changes, such as changes in gene expression occurring in human myogenic precursor cells during ageing. However, changes that occur in cells during prolonged ex vivo culture need to be considered when analyzing phenotypic and genotypic changes occurring during ageing. We recommend using freshly isolated cells for this purpose. Moreover, the primary myoblast culture method described here allows for expansion and relatively long-term culture of human primary myoblasts, allowing for robust in vitro functional studies. We have previously shown that myogenic progenitor cells isolated using our method can be used for both expression profiling and functional studies of processes associated with muscle ageing22. This method is also applicable to the muscles of adult and old rodents and allows for isolation of an enriched culture of myoblasts that can be used for profiling genetic and epigenetic changes during ageing and functional studies22. The limitations of this method include the use of, to some degree, mixed population of cells rather than a pure population of satellite cells, which can be obtained using more sophisticated published methods6,28,29,39,40,41,42,43. We present a simplified, affordable, and reproducible protocol for the isolation of primary myoblasts cells from adult and aged humans. In our experience, the available, more sophisticated methods of isolation and culture of human primary myoblasts (such as MACS- or FACS-sorted satellite cells) are ideal for some types of studies, such as profiling transcriptomic or proteomic changes in the cells. However, these methods are expensive, require at least some level of expertise, and may prove difficult due to the low proliferative rate of pure primary myoblast cultures and fibroblasts overgrowing myoblasts. We present a reproducible protocol that permits the simple isolation and culture of human primary myoblasts for use in functional studies. Additionally, we propose the use of laminin42 and the limited use of bFGF as key factors for a successful culture44. We also propose avoiding the stress generated by centrifugation when splitting the cells and one pre-plating step at the first passage45. To summarize, we have optimized an efficient protocol for isolation and culture of primary myoblasts/MPCs from the muscles of adult and aged humans that is also applicable to the muscles of rodents and enables expression and functional studies of muscle homeostasis. This work is supported by the Biotechnology and Biological Sciences Research Council (BBSRC; BB/L021668/1), the MRC and Arthritis Research UK as part of the MRC - Arthritis Research UK Centre for Integrated Research into Musculoskeletal Ageing (CIMA) and the Wellcome Trust Institutional Strategic Support Fund (097826/Z/11/A). The authors would like to thank Dr Dada Pisconti (University of Liverpool) for her expertise and advice in the isolation of muscle progenitor cells. 60 mm Petri dishes Greiner Bio One 628160 Cellstar Cell culture dish, PS, 60/15 MM, VENTS. Cell culture plates (6-well) Sigma-Aldrich CLS3516 Corning Costar cell culture plates. 6-well, flat bottom (Individually wrapped) . Cell culture plates (12-well) Greiner bio-one 657 160 Cellstar Cell culture Multiwell Plates. Culture flasks Greiner Bio One 690175 (25 cm2); 658175 (75 cm2). Cellstar Filter Cap Cell Culture Flasks. Standard Disposable Scalpel Granton 91310 Sterile stainless steel blade, pattern: 10. Pipettes Greiner bio-one 606 180 (5 mL); 607 180 (10 mL); 760 180 (25 mL) Cellstar Serological Pipettes. Pasteur plastic pipettes Starlab E1414-0311 3.0 mL Graduated Pasteur Pipette (Sterile), Ind. Wrapped. Syringe BD 300613 20 mL BD eccentric tip syringe. 0.2 µm filters Gilson ALG422A Sterile Syringe Filters CA 0.2 µm 33 mm Pk50. Cell strainers Fisher Scientific 11597522 Cell culture strainer sterile individually packed 70 µm polypropylene. Dispase II Sigma-Aldrich D4693 Dispase II Protease from Bacillus polymyx. Activity: ≥0.5 U/mg solid. Laminin Sigma-Aldrich 114956-81-9 Laminin from Engelbreth-Holm-Swarm murine sarcoma basement membrane. 1 mg/mL. DMEM-high glucose Sigma-Aldrich D5671 Dulbecco’s Modified Eagle’s Medium - high glucose. With 4,500 mg/L glucose and sodium bicarbonate, without L-glutamine and sodium pyruvate. F-12 media Gibco 21765029 Ham's F-12 Nutrient Mix. 1x + L-glutamine. FGF-b PetroTech 100-18B Recombinant human basic Fibroblast Growth Factor. Fetal Bovine Serum (FBS) Gibco 10270-106 Fetal Bovine Serum. Horse serum (HS) Sigma-Aldrich H1270 Horse Serum. Donor herd, USA origin, sterile-filtered. Penicillin-Streptomycin Sigma-Aldrich P0781 Penicillin-Streptomycin with 10,000 units penicillin and 10 mg streptomycin per mL in 0.9% NaCl, sterile-filtered. L-Glutamine Sigma-Aldrich G7513 L-Glutamine solution. 200 mM, solution, sterile-filtered. Trypsin-EDTA Sigma-Aldrich T4049 Trypsin-EDTA solution. 0.25%, sterile-filtered. TrypLE Express Gibco 12604-013 TrypLE Express Enzyme (1x), no phenol red. DPBS (cell culture) Sigma-Aldrich D8537 Dulbecco’s Phosphate-buffered Saline. Modified, without calcium chloride and magnesium chloride. PBS (immunostaining) Sigma-Aldrich P4417-50TAB Phosphate-buffered saline tablet. One tablet per 200 mL of deionized water (0.01 M phosphate buffer, 0.0027 M potassium chloride and 0.137 M sodium chloride, pH 7.4). Triton X-100 Sigma-Aldrich T8787 Triton X-100 for molecular biology. anti-MF 20 antibody DSHB MF20-c 2ea 211 µg/ml. MYH1E (MF 20) Mouse mAb. anti-MyoD antibody Cell Signaling Technology 13812P MyoD1 (D8G3) XP Rabbit mAb. anti-Ki67 antibody Abcam ab16667 Rabbit mAb to Ki67 [SP6]. Anti-mouse 488 secondary antibody Invitrogen A-11029 Goat anti-Mouse IgG (H+L) Secondary Antibody, Alexa Fluor 488 conjugate. Anti-rabbit 488 secondary antibody ThermoFisher Scientific A-11034 Goat anti-Rabbit IgG (H+L) Secondary Antibody, Alexa Fluor 488 conjugate. Senescence β-Galactosidase Staining Kit Cell Signaling Technology 9860 Senescence β-Galactosidase Staining kit. DMSO Sigma-Aldrich 41639 Dimethyl sulfoxide. BioUltra, for molecular biology, ≥99.5% (GC). Acridine Orange Sigma-Aldrich A8097 Acridine Orange hydrochloride solution, 10 mg/mL in H2O. Ethidium bromide Sigma-Aldrich E1510 Ethidium bromide solution. BioReagent, for molecular biology, 10 mg/mL in H2O. Centrifuge rotor Heraeus 3360 Heraeus Sepatech Megafuge Centrifuge Rotor BS4402/A. Max. radius: 15.5 cm. Eclipse Ti-E Inverted Microscope System Nikon n/a Eyepieces: CFI 10X/22; Total magnification: 100X (MF20, Live/dead and Ki67). Axiovert 200 inverted microscope Carl Zeiss n/a Eyepieces: Carl Zeiss 1016-758 W-PI 10X/25; Total magnification: 100X (Senescence β-Galactosidase Staining). Axiovert 25 inverted microscope Carl Zeiss n/a Eyepieces: E-PL 10X/20. Total magnification: 100X (bright field). Diaphot Inverted Tissue Culture Microscope Nikon n/a Eyepiece: CFWN 10X/20. Total magnification: 100X (bright field). Hughes, V. A., et al. Longitudinal muscle strength changes in older adults: influence of muscle mass, physical activity, and health. J Gerontol A Biol Sci. 56, B209-B217 (2001). Ryall, J. G., Schertzer, J. D., Lynch, G. S. Cellular and molecular mechanisms underlying age-related skeletal muscle wasting and weakness. Biogerontology. 9, 213-228 (2008). Uezumi, A., Fukada, S., Yamamoto, N., Takeda, S., Tsuchida, K. Mesenchymal progenitors distinct from satellite cells contribute to ectopic fat cell formation in skeletal muscle. Nat Cell Biol. 12, 143-152 (2010). Lexell, J., Taylor, C. C., Sjostrom, M. What is the cause of the ageing atrophy? Total number, size and proportion of different fiber types studied in whole vastus lateralis muscle from 15- to 83-year-old men. J Neurol Sci. 84, 275-294 (1988). Grounds, M. D. Reasons for the degeneration of ageing skeletal muscle: a central role for IGF-1 signalling. Biogerontology. 3, 19-24 (2002). Carlson, M. E., et al. Molecular aging and rejuvenation of human muscle stem cells. EMBO Mol Med. 1, 381-391 (2009). Brown, D. M., Goljanek-Whysall, K. microRNAs: Modulators of the underlying pathophysiology of sarcopenia? Ageing Res Rev. 24, 263-273 (2015). Brooks, S. V., Faulkner, J. A. Contraction-induced injury: recovery of skeletal muscles in young and old mice. Am J Physiol. 258, C436-C442 (1990). Lepper, C., Partridge, T. A., Fan, C. M. An absolute requirement for Pax7-positive satellite cells in acute injury-induced skeletal muscle regeneration. Development. 138, 3639-3646 (2011). Mauro, A. Satellite cell of skeletal muscle fibers. J Biophys Biochem Cytol. 9, 493-495 (1961). Charge, S. B., Rudnicki, M. A. Cellular and molecular regulation of muscle regeneration. Physiol Rev. 84, 209-238 (2004). Brack, A. S., Rando, T. A. Intrinsic changes and extrinsic influences of myogenic stem cell function during aging. Stem cell Rev. 3, 226-237 (2007). Kadi, F., Charifi, N., Henriksson, J. The number of satellite cells in slow and fast fibres from human vastus lateralis muscle. Histochem Cell Biol. 126, 83-87 (2006). Verdijk, L. B., et al. Satellite cell content is specifically reduced in type II skeletal muscle fibers in the elderly. Am J Physiol Endocrinol Metab. 292, E151-E157 (2007). Collins, C. A., Zammit, P. S., Ruiz, A. P., Morgan, J. E., Partridge, T. A. A population of myogenic stem cells that survives skeletal muscle aging. Stem cells. 25, 885-894 (2007). Bortoli, S., et al. Gene expression profiling of human satellite cells during muscular aging using cDNA arrays. Gene. 321, 145-154 (2003). Thalacker-Mercer, A. E., Dell'Italia, L. J., Cui, X., Cross, J. M., Bamman, M. M. Differential genomic responses in old vs. young humans despite similar levels of modest muscle damage after resistance loading. Physiol Genomics. 40, 141-149 (2010). Jejurikar, S. S., et al. Aging increases the susceptibility of skeletal muscle derived satellite cells to apoptosis. Exp Gerontol. 41, 828-836 (2006). McArdle, A., Dillmann, W. H., Mestril, R., Faulkner, J. A., Jackson, M. J. Overexpression of HSP70 in mouse skeletal muscle protects against muscle damage and age-related muscle dysfunction. FASEB J. 18, 355-357 (2004). Sousa-Victor, P., et al. Geriatric muscle stem cells switch reversible quiescence into senescence. Nature. 506, 316-321 (2014). Cornelison, D. D. Context matters: in vivo and in vitro influences on muscle satellite cell activity. J Cell Biochem. 105, 663-669 (2008). Soriano-Arroquia, A., McCormick, R., Molloy, A. P., McArdle, A., Goljanek-Whysall, K. Age-related changes in miR-143-3p:Igfbp5 interactions affect muscle regeneration. ageing cell. 15, 361-369 (2016). Goljanek-Whysall, K., et al. Regulation of multiple target genes by miR-1 and miR-206 is pivotal for C2C12 myoblast differentiation. J Cell Sci. 125, 3590-3600 (2012). Georgantas, R. W., et al. Inhibition of myogenic microRNAs 1, 133, and 206 by inflammatory cytokines links inflammation and muscle degeneration in adult inflammatory myopathies. Arthritis Rheumatol. 66, 1022-1033 (2014). Sharples, A. P., Al-Shanti, N., Stewart, C. E. C2 and C2C12 murine skeletal myoblast models of atrophic and hypertrophic potential: relevance to disease and ageing? Journal of cellular physiology. 225, 240-250 (2010). Hidestrand, M., et al. Sca-1-expressing nonmyogenic cells contribute to fibrosis in aged skeletal muscle. J Gerontol A Biol Sci Med Sci. 63, 566-579 (2008). Alsharidah, M., et al. Primary human muscle precursor cells obtained from young and old donors produce similar proliferative, differentiation and senescent profiles in culture. ageing cell. 12, 333-344 (2013). Agley, C. C., Rowlerson, A. M., Velloso, C. P., Lazarus, N. L., Harridge, S. D. Isolation and quantitative immunocytochemical characterization of primary myogenic cells and fibroblasts from human skeletal muscle. J Vis Exp. (2015). Pietrangelo, T., et al. Molecular basis of the myogenic profile of aged human skeletal muscle satellite cells during differentiation. Exp Gerontol. 44, 523-531 (2009). Webster, C., Pavlath, G. K., Parks, D. R., Walsh, F. S., Blau, H. M. Isolation of human myoblasts with the fluorescence-activated cell sorter. Exp Cell Res. 174, 252-265 (1988). Woods, K., Marrone, A., Smith, J. Programmed cell death and senescence in skeletal muscle stem cells. Annals of the New York Academy of Sciences. 331-335 (2000). Chakkalakal, J. V., Jones, K. M., Basson, M. A., Brack, A. S. The aged niche disrupts muscle stem cell quiescence. Nature. 490, 355-360 (2012). Cornelison, D. D., et al. Essential and separable roles for Syndecan-3 and Syndecan-4 in skeletal muscle development and regeneration. Genes & development. 18, 2231-2236 (2004). Pisconti, A., Cornelison, D. D., Olguin, H. C., Antwine, T. L., Olwin, B. B. Syndecan-3 and Notch cooperate in regulating adult myogenesis. J Cell Biol. 190, 427-441 (2010). Schafer, R., et al. Age dependence of the human skeletal muscle stem cell in forming muscle tissue. Artificial organs. 30, 130-140 (2006). Castiglioni, A., et al. Isolation of progenitors that exhibit myogenic/osteogenic bipotency in vitro by fluorescence-activated cell sorting from human fetal muscle. Stem cell reports. 2, 92-106 (2014). Stewart, J. D., et al. Characterization of proliferating human skeletal muscle-derived cells in vitro: differential modulation of myoblast markers by TGF-beta2. J Cell Physiol. 196, 70-78 (2003). Wagner, W., et al. Aging and replicative senescence have related effects on human stem and progenitor cells. PloS one. 4, e5846 (2009). Gaster, M., Kristensen, S. R., Beck-Nielsen, H., Schroder, H. D. A cellular model system of differentiated human myotubes. APMIS : acta pathologica, microbiologica, et immunologica Scandinavica. 109, 735-744 (2001). Gaster, M., Beck-Nielsen, H., Schroder, H. D. Proliferation conditions for human satellite cells. The fractional content of satellite cells. APMIS : acta pathologica, microbiologica, et immunologica Scandinavica. 109, 726-734 (2001). Danoviz, M. E., Yablonka-Reuveni, Z. Skeletal muscle satellite cells: background and methods for isolation and analysis in a primary culture system. Methods Mol Biol. 798, 21-52 (2012). Chowdhury, S. R., et al. One-Step Purification of Human Skeletal Muscle Myoblasts and Subsequent Expansion Using Laminin-Coated Surface. Tissue engineering. Part C, Methods. 21, 1135-1142 (2015). Mamchaoui, K., et al. Immortalized pathological human myoblasts: towards a universal tool for the study of neuromuscular disorders. Skeletal muscle. 1, 34 (2011). Natarajan, A., Lemos, D. R., Rossi, F. M. Fibro/adipogenic progenitors: a double-edged sword in skeletal muscle regeneration. Cell cycle. 9, 2045-2046 (2010). Ciofani, G., et al. Hypergravity effects on myoblast proliferation and differentiation. J Biosci Bioeng. 113, 258-261 (2012).